Samhail mhaide den stéaróideach lanosterol. Léiríonn líon iomlán na gcarbón a bhunús trítheirpéinóideach. Is éard is stéaróideach ann ná lipid theirpéinóideach arb é a príomhthréith a chroí steréin agus grúpaí feidhmiúla breise. Tá a croí comhdhéanta de struchtúr carbóin de cheithre fáinní comhleáite: trí fáinní cioglaiheacsán agus fáinne amháin cioglaipeintáine. Athraíonn na stéaróidigh de réir na grúpaí feidhmiúla a ghabhann leis na fáinní seo agus staid ocsaídithe na bhfáinní. Tarlaíonn raon leathan de chomhdhúile ceimiceacha go nádurtha i bplandaí, in ainmhithe, agus i bhfungais. Michael W. King's Medical Biochemistry. Steroids and retinoids are both terpenes that are hydrophobic, pass through cell membranes and bind to intracellular receptors. 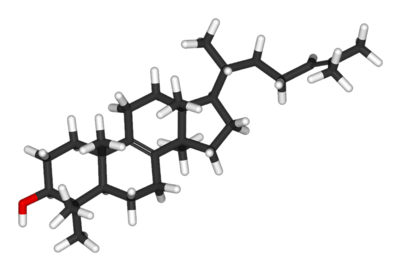 However, retinoic acid is not a steroid because it does not have the defining ring structure. See: Steroids and Related Hydrophobic Molecules. Insidermedicine in 60 - Trans Fats, Steroid Rage, Calcium and Needlesticks -- Video: Insidermedicine.com's Dr. Sanjay Sharma on Trans Fats, Steroid Rage, Calcium and Needlesticks. Nomenclature of Steroids Home Page at Queen Mary University of London. Tugadh an leathanach seo cothrom le dáta an 9 Márta 2013 ag 23:43.